After hearing Graham speak so enthusiastically about his business, it’s easy to see why Kusaga Athletic has been successful. As an environmental activist and avid marathon runner, Graham is one of those lucky few whose business solely reflects their passions. Forward thinking in all his ventures, Graham’s goal is to become a leader in sustainable apparel that promises profit for purpose as opposed to monetary gain. A believer in revolutionising the textile industry, Kusaga Athletic aims to benefit the wearer and the planet too. We sat down with Graham to discuss t-shirts, his Kickstarter campaign and his journey back to Queensland with the HotDesQ Program. Tell me a bit about the Kusaga Athletic origin story? Back in 2010, I was in Singapore with my wife when one of her coworkers invited us for dinner. I met her husband and he told me he was going to run a marathon and asked me if I’d like to join him. 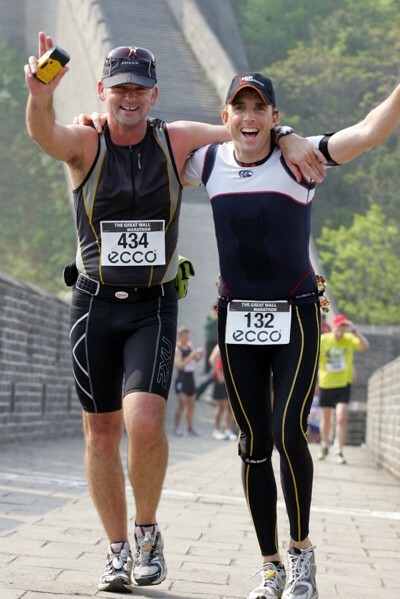 It wasn’t a normal marathon mind you, but the Great Wall of China. It’s a 42km run over the Great Wall of China which includes 5232 steps in average 30-degree heat. I politely said ‘no, nup, not interested go away’, and then I signed up on Monday. So, Matt and I ran the marathon together. Matt and I formed a bond as it was a really special time. People talk about pivotal moments in life and I suppose that was one of them. From there we talked about starting a business together but by that time I had moved from Singapore to London. What it did give me was the drive to start doing triathlons and other running races. I soon became very passionate about it. Every time I finished one of these races I got a finishing t-shirt which are, quite frankly, very horrible scratchy things. And they stink! They didn’t fit very well and were quite unpleasant to wear. I asked a bunch of friends if they had similar problems and they agreed that they had. That’s when I started doing some research. That research changed my life. I discovered how nasty my little wardrobe was on the planet as it was full of nylon, polyester, cotton — which I think is quite reflective of most people’s wardrobes. It was during this time that I discovered that the textile industry is the second largest polluter on the planet, just behind the oil industry. It emits five times more gases than the airline industry! I thought it was pretty crazy and ascertained there could be some business in making clothes from alternative, natural products. I started investigating on the ‘ol Google and found myself perusing through published papers and scientific reports. I located some fibers and found some that had been released but not taken up. I immediately picked up the phone and enquired about them, and over time the people I spoke to got comfortable with what I was trying to do and were quite surprised that I was trying to make sportswear. I secured about twelve different fibers and looked up how to make fabric. Through a few conversations, I found out about a company in Korea and set about making at least one fabric. We ended up making four…and so many failures! Trying to get everything to work was soul destroying at times to the point where I thought, ‘why am I bothering?’ It had to all be sustainable so we were trying to get the factory to work differently to how it worked. There was also a pretty significant language barrier but thankfully Matt and I had a slight understanding of communication and subtitles due to having lived in Asia. We ended up making the fabrics and a company in Malaysia helped us make the run t-shirts. We were even able to get a grant from the Singapore government which was great! We were happy with the product but we needed to test the market to see if anyone really cared about sustainability. We signed up for Kickstarter and launched what we called ‘The greenest t-shirt on the planet.’ It was our chance to put our shirt against every cotton t-shirt people owned and from an environmental point of view we got to compare the impact of cotton t-shirts and impact of our shirts. An average cotton t-shirt (and this will shock you) uses 3000 litres of water to make. Yep! By the time you irrigate the crop and manufacture the shirt it’s about 3000 litres. It can even be three times that depending on where it’s coming from. Our t-shirt uses less than 1%, so about 21 litres. It has no pesticides either. They’ve tested cotton shirts that have 400 different chemicals on them. So, you don’t know what leaks into your skin! Then, from a really geeky point of view, we use 80% less land per tonne of fiber. Thinking of climate change going forward, and the scarcity of land, I’d much rather be using that land to grow crops than clothing materials. We successfully funded and had 400 people who bought between 1–4 shirts. It also gave us the opportunity to talk directly to our customer base which was very important to us. It wasn’t about the money, it was to learn the marketing needed to understand how we could better communicate what we wanted to achieve. How did the Kickstarter go? The Kickstarter ended up creating another problem. A couple of hours after we were successfully funded I called up the Malaysian company and they told me that they were shutting the business down. So, we had a successfully crowdfunded campaign, had the fabric but had no one to make it. We couldn’t deliver to our pledgers. It was a pivotal point in our business because we had to make a decision. Are we a business that shuffled the problem and hid away or are we a business that really owns it and are transparent with customers? We spent the next year developing our sportswear and activewear which we launched to the market in December last year. Our goal was to create a business that is responsible with the materials we use and focused on the future. We wanted something that would positively impact people and the planet. Your website says you’re part of the B Corporation. Can you tell me more about that? The B Corporation is an independent certification organisation that was formed by three businessmen in the US who believed business could be used as a force for good. It’s a very rigorous certification process working across the pillars of people, environment, and ethical regions. There are about 2200 companies certified globally, with the headliners being Patagonia and Ben and Jerry’s. We gained B Corp certification and we used that as a framework to help us grow as a business, such as strengthening areas that needed improving on and giving the business structure. It also gave me a community of like-minded people. Just two weeks ago we were announced as the winner of B Corp’s ‘Best for the Environment’ category. That’s not bad for an emerging company! What has surprised you most about starting your own business? Firstly, the support from areas you don’t expect and lack of support from areas you’d expect. Secondly, the level of grit required every day. I think the most important thing about starting a business is finding something that lights you up. 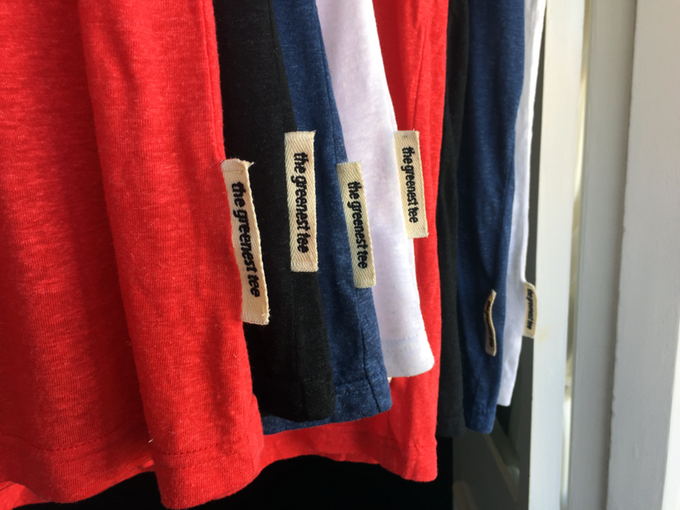 When I started this business, I didn’t have a passion for making the greenest t-shirt on the planet, I was just trying to solve a problem and that problem opened the door up to a passion I didn’t know existed until now. The passion is the thing that drives you. What made you join the Hot DesQ program? I was looking to change up the business. I’d been back in the country two years and we’d been growing steadily. It’s good to find yourself in a new ecosystem. I’d spoken to one of the previous cohorts and he spoke very highly of the support he received from the QLD government. I saw it as a great opportunity to accelerate my business due to the government support and active local entrepreneur groups. Find something you love doing and that you’d do for free. If you’re willing to do it for nothing then you’ll be able to work through the period of challenges. If you only do something because someone pays you then starting your own business might not be the best option! Do you believe everyone has a passion? I believe everyone has a passion but not everyone is an entrepreneur. I don’t think people always allow passion to flourish through their lives and that’s really sad. I think we all have a couple of passions. There’s never been a better time to start a business in history than now. We have the technology, we’re globally connected to a global marketplace and you can pretty much access anything to launch a business for virtually nothing. There’s no better time to start a business, especially to dabble or have a side business. However, I believe if you really love something and you’re passionate about it, go 150%. If you’re trying to play both sides of having a job and side hustling you’ll have a hard time getting anything up and running. Do you ever think about going back to a 9 to 5 job? Every day! As an entrepreneur, you have to make every single decision and some days it gets very tiring and it would be nice for someone else to take over that role. It comes and goes through. I love what I do and I’m incredibly lucky. Everything that has happened in the past three years has been a direct result of the decision I made to start my own company, including finding myself here! Interested in HotDesQ? See if you’re eligible for the next round. No Replies to "Interview with Graham Ross, Co founder of Kusaga Athletic"